Within the Family Support and Leadership priority area, the Waisman Center UCEDD works to promote and strengthen the participation of families that include a person with disabilities in partnerships with professionals and providers, community members, and elected officials. With their participation in family support and leadership-building activities, families are able to assume a role in the improvement of systems of supports and service for people with disabilities and are an invaluable asset to providers and policy makers. Best practice recognizes that family members and individuals with disabilities provide a perspective critical to the successful development of effective policies and practices. Family involvement will increase the likelihood that systems of support and services are helpful, effective, and efficient and provide the greatest possible flexibility regarding the nature and use of services and support and maximize community inclusion and natural supports. Provides service to family members, volunteers, direct care providers, special education teachers, transportation providers, para-professional and professional service providers from all settings providing services in Dane County for people with developmental disabilities. The purpose of this program is to provide graduate education to interdisciplinary maternal and child health trainees, to prepare them to assume key leadership positions in education, service, research, administration and advocacy to improve the health and well-being of the MCH population. The UCEDD supports a variety of efforts at the state level that provide input to policy makers on a wide range of topics that impact the lives of people with disabilities and their families. We do this primarily through participation on coalitions, advisory committees and state councils. The PROMISE initiative is intended to improve services for youth SSI (Social Security Supplemental Security Income) recipients and their families to help youth recipients achieve better outcomes, including graduating from high school ready for college and a career, completing postsecondary education and job training, and obtaining competitive employment in an integrated setting. A Family Network is group of families committed to working together to learn and increase the quality of life for their family members with disabilities. Family Networks facilitate and connect families to do together what no one family can do alone. Well informed and supported family networks can solve challenges by developing creative solutions to shared problems such as transportation, community living, community integration, community employment. The Family Network Project will assist a total of 9 new family-led groups around the state of Wisconsin over the next three years. This is a partnership with BPDD in which Living Our Visions (LOV) will provide coordination, technical assistance, facilitation and training to these groups. The Family Action Network provides information about opportunities for education, training and leadership development to members who would like to contribute their voice to improve systems for people with disabilities and special health care needs in Wisconsin. 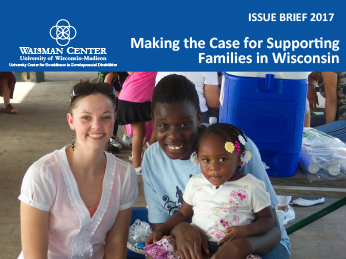 Family Support 360 was a 5-year project funded by the Administration on Developmental Disabilities and located at the Harambee Center, in collaboration with the Waisman Center, Exchange Center for the Prevention of Child Abuse, Dane County Human Services, and the Department of Health Services. Wisconsin Family Leadership Institute (WiFLI) is a new opportunity for Wisconsin families to participate in an intensive leadership development experience.